Ever since Roo started in pre-school I have always tried to attend workshops, activities and events. Making arrangements with work so I can finish early or change my days to be able to attend. 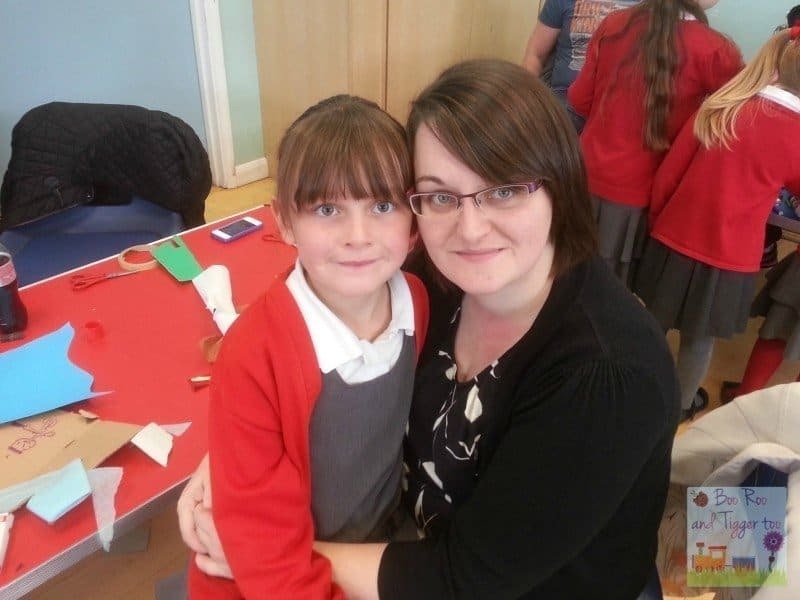 Throughout her time in pre-school it became evident that it was the same parents who attended these opportunities which was sad to see for the children whose parents never attended. I was lucky in that I was able to take Tigger with me to the story cafes and craft days as the teachers welcomed younger siblings to attend too and it meant that I was able to be there for Roo as well as assisting the school. I did the same for Tigger whilst he was in pre-school which of course was easier as Roo was in full-time school and I was able to juggle my work commitments without having to change childcare arrangements too. When Roo moved to Junior school the opportunity to have parental participation in her school life dropped to being a taxi service whenever she has a sporting event to attend at another school. So I was worried that when Tigger start at the same school last month that there would be little opportunity for me to take an active role in his schooling. However his teachers are keen to get parents involved, which I am pleased to hear. I’ve just had my DBS check come back and have volunteered to help listen to the children read once a week until Piglet arrives. With story cafes and other activities planned for the future I’m hopeful that I can play an active role in what he gets up to at school. Do you get involved with your child’s school? I’m a member of the school PTA so help with the Disco’s and Christmas/Summer fairs….It’s great fun seeing the kids in their school environment! I love helping out at school! I’ve only just started though now that my youngest has started school, as I wasn’t able to bring her along too when my oldest started. I help out with swimming once a week which is a bit chaotic and then reading with the younger ones. I also went along to help bake gingerbread men last week which I really enjoyed. I like seeing how they get on at school and getting to know the other children in their class. You’re so lucky to be able to get involved so fully with your children’s school activities. I’ve been lucky too and it’s one of the things I’m most wary of now in looking for a new job that it might not have the same flexibilities. Funny enough my DBS has just come back too! I’m getting involved with CM’s year group and ‘kerbcraft’, it’s only until Christmas but at least I’ve got a DBS for school and church now which means I can get involved as and when it’s possible.